I'm proud to present you this week my newest system - F4 for all Even Bets. This system is based on a very original idea I had a few months ago and the last 4 months' live play and tests have shown a huge profitability of the system and it's time to share it with you by having it available on the market. The forte of the system is its betting method and therefore it will work with almost any bet selection you may have. F4 works for all even bets, for Red/Black, High/Low, Even/Odd in Roulette, for Pass Line/Don't Pass Line in Craps, Player/Banker in Baccarat, Big/Small in Sic-Bo and Casino War. You could use either side of an even bet or one of your favorite bet selections, F4 will generate thousands of units on the long run. You must be wondering if F4 uses flat bets or a progression. The answer is both. If your bet selection does fine with flat bets, then the system remains in flat bets. Should your losses become more frequent than your wins, the system switches you into a progression mode, where a win or two will bring you back straight into your flat betting zone automatically. Each completed run generates 1 unit profit. The system can be played with various loss limits for a particular session, each limit providing different levels of profits. 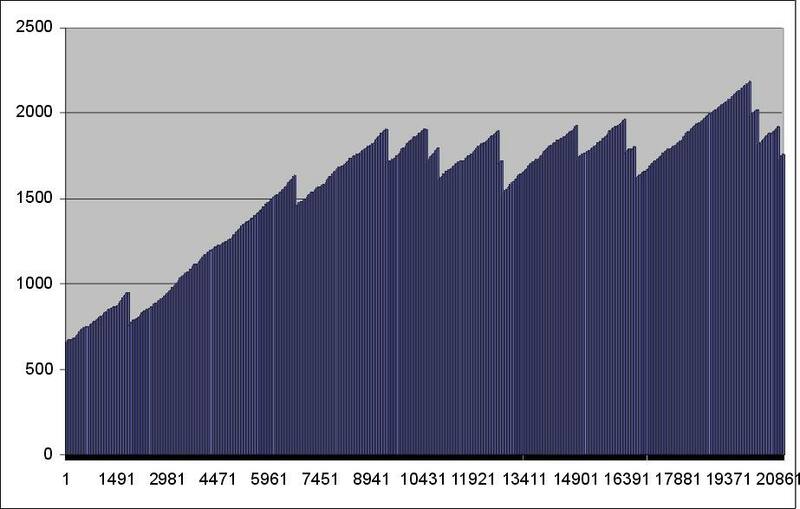 Just to give you an idea on its performance, F4 generated +656 units for the first 20,000 hands of the Zumma tester book on 600 shoes. Alternating bet selections, F4 generated another +900 units for the second set of 20,000 decisions. With a 53 unit session bankroll, F4 generates more than 600 units, about 1 unit per shoe in average, taking losses and commissions into account, for the entire Zumma 600 Baccarat shoes, for which a lifetime bankroll of 100 units is sufficient. The largest drawdown for those profits was not more than 60 units overall. 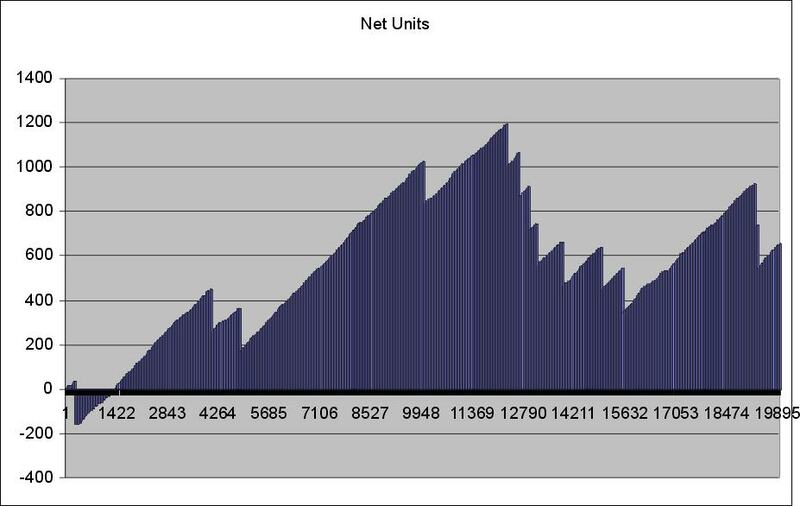 With a 196 unit session bankroll, F4 generates 1500 units for the entire Zumma 600 Baccarat shoes, or 2.5 units per shoe in average, for which a lifetime bankroll of 400 units is more than enough, also having taken losses and commissions into consideration. The largest drawdown for those results were not more than 180 units. Within the first 20,000 decisions, the session bankroll of 196 units is lost 13 times, which does not affect overall profitability, which reaches 1200 units at peak. Within the second 20,000 decisions, exactly the same occurs, that is, 13 lost sessions, reaching 2200 units at peak, despite the fact that we change bet selections, which shows that the system is bet selection independent and wins consistently. The following profit graphs will show you what I mean, the first one for the first 20,000 hands and the second one for the second 20,000 hands of 600 Zumma shoes. All test results will be provided to you as separate attachments to the 27 page system document. The system is not hard to learn. A few hours of practice will put you in action. The system price is only $85, very affordable and inexpensive relative to its great performance. You have 30 days to test the system on paper, without spending a penny. If the system doesn't perform to your liking, you can return it for a full refund, you have my guarantee. I am confident F4 will be a great contribution to your collection of winning ideas. Click here to order, $5 is charged extra for a printout.